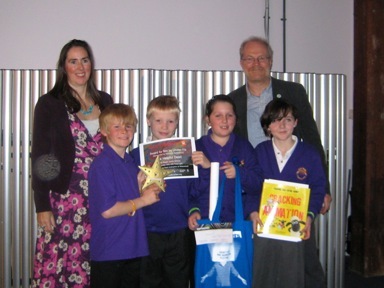 The Helpful Dead has won Best Film by primary age children at the Electric December 2012 awards in Bristol. 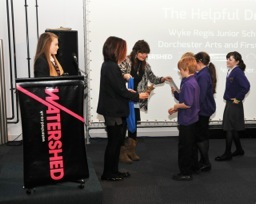 Four of the filmmaking team from Wyke Regis Junior school joined facilitators Sharon Hayden and Alastair Nisbet from ScreenPLAY to receive the award at Bristol's Watershed - and a bag of film goodies from sponsor Aardman Animation. 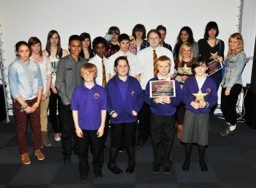 Project producer Sharon Hayden said it was a wonderful achievement for the ten year old filmmakers. Other winners travelled from as far away as Poland for this year’s awards. Best animation went to 20 year old Agnieszka Konarska for her atmospheric film Hunt about a Raven and its bid to escape. Best Comedy went to Taking Out Tim by Tiverton High School with My Pockets, and Best documentary to Adrenaline Junky, a moving film about a motorcyclist regaining his action packed lifestyle after an accident. Electric December producer Hannah Higginson said the films had all been chosen for their imaginative and distinctive style. “I’ve been knocked out by the huge amount of flair and talent on show this year. We are committed to developing new talent and it’s a joy to see the exciting range of films from across Europe. 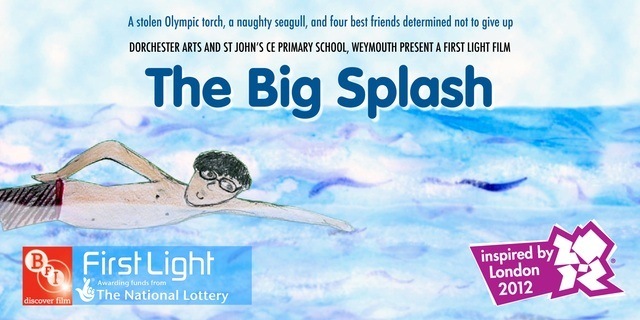 All the Electric December films are on the website electricdecember.org - including The Big Splash, one of the other Dorchester Arts Olympic films by St John’s Primary School in Weymouth. The Helpful Dead was based on a real life tragedy and characters were inspired by Victorian works of art in Birmingham and Cambridge. Read about the real people behind the story. The Helpful Dead was funded by the Lottery's First Light initiative with additional support from b-side, Departure Arts and the school itself. In the days of sail, Lyme Bay was a notorious danger spot for shipping. If you allowed yourself to come too close to the shore, prevailing winds could make it impossible to clear Portland Bill. Many ships foundered on Chesil beach and the Cove acquired a nickname “Dead Man’s Cove”. The wrecked ships’ cargoes were scavenged by the people of Wyke and many of the dead crew buried in Wyke churchyard. The first draft of the script for the Helpful Dead included skeletons of long dead seamen coming back to life to save an Olympic yachtsmen but it was only in the latter stage of script development with mentor Peter Snelling that he asked the key question: “Why would they ?”. Why let generations of sailors die and then choose to save one in particular ? There had to be a link with the past. While the children were researching shipwrecks off the Chesil, year leader Miss Lynch produced some old leather bound volumes that had been in school for decades - the head teachers logbook. The book, written in pen and ink script, is the diary by successive head teachers from 1863 - an extraordinary first hand account of all major events affecting school life. Some days there were no children in school because they were out in the fields bringing in the harvest - on others they were on the Chesil, scavenging off wrecked ships. “It being my birthday, I have decided to close the school for a holiday,” he declares one day. 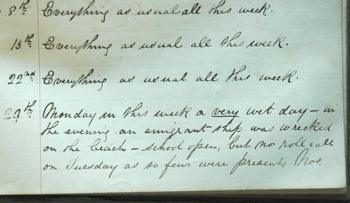 Then in November 1872 he writes “Monday in this week, a very wet day - in the evening an emigrant ship was wrecked on the beach. School open but no roll call as so few were present.” The Royal Adelaide, carrying families to a new life in Australia had foundered on Chesil beach. Most passengers were saved but six, including a young girl drowned. In The Helpful Dead a Victorian mother sees her boy drown as a ship sinks off the Chesil - and we cut to 2012 to find a Olympic sailor in trouble who looks the image of the Victorian mother. The long-dead boy looks up from his watery grave and thinks she is his mother. He summons the Helpful Dead back to life with the words - “It happened to us, don’t let it happen to them”. So with script complete, what should our women look like ? 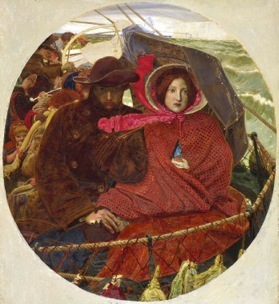 We studied Ford Maddox Brown’s famous painting Last of England in the Fitzwilliam Museum in Cambridge and Birmingham Museum and Art Gallery. A young family are leaving England for a new life on an 1860’s emigrant ship. The mother, holding the hand of a baby under her cloak is strikingly beautiful. 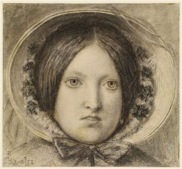 The model for the picture was the artist’s wife Emma and our Year Five artists were able to use Maddox Brown’s sketches of her as their inspiration for both Joseph’s mother and our Olympic sailor Serena. 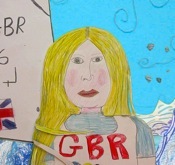 Every primary school in Dorset is to receive a DVD of short animated films made for the Olympics by primary school children in Weymouth and Portland. With support from Departure Arts and b-side Multimedia Arts Festival, a team of artists and filmmakers from Dorchester ARTS spent last term working with more than 130 children at Underhill Junior School on Portland, Wyke Regis Junior School and St John’s Primary School. The films, the Portland Race, the Helpful Dead and the Big Splash tell three very different stories about, Weymouth, Portland and the Olympics. Project producer Sharon Hayden said she hoped other schools would use them as a stimulus for discussion in their work on London 2012. The films, lottery funded by the BFI’s First Light initiative, are being distributed by Departure Arts. You can also view and request copies on the website at www.dorchesterarts.org.uk/projects . The films are: The Helpful Dead by year five at Wyke Regis Junior School A majestic tall ship sunk off Dead Man’s Cove, Portland in 1872 has a dramatic emotional link with the 2012 sailing events. The Portland Race by year four at Underhill Junior School When Olympic boats fill the harbour - there’s only one thing for a father and son to do - go fishing by moonlight in a tiny Lerret boat. The Big Splash by Year Five at St John’s Primary When the Olympic torch is sensationally stolen amid crowds on Weymouth seafront, four best friends make a splash in more ways then one as they try to get it back. Coming Soon - the Sadness of King George - a three minute action drama animation by Year Five Children at Beechcroft St Paul’s Primary School in Weymouth. We’ve been working with a class of 30 - developing dialog through drama, drawing and animating characters, making them walk and talk, and creating an exciting soundtrack. We’re planning an end of March premiere and an April release. Screenings at Beechcroft St Paul’s School, Weymouth College, Dorchester Arts - and later in the year, the big screen on Weymouth beach. An animated Peregrine Falcon leads you along The Legacy Trail - a 13 mile trail through Weymouth to Portland Bill along the stunning Jurassic coast. The trail is one of the Dorset town’s London 2012 Olympic legacies, offering visitors and local people a chance to explore the wild side of this stunning part of the country. The Peregrine, drawn by Nic Rawling of the Paper Cinema specially for the project, guides viewers through reedbeds, along Weymouth’s bucket and spade seafront to a hidden trail on the old railway line to Portland Harbour and the extraordinary Chesil beach. From Underhill, it goes up the Merchants’ Incline, the track of a historic horse drawn tramway used to move Portland stone to the dock in the 19th century and into a fascinating maze of of old quarry workings, complete with 150 year old tunnels - and, if you can spot it, a fine example of a fossilised tree. From the Quarries, the trail moves on to the Engine shed, where steam locos on the Portland line were refuelled and maintained, before moving down to the East Weares, a spectacular coastal section - complete with its own herd of wild native goats. Here you could easily see a pair of the island’s resident Peregrines with their young, calling to them from the clifftop. The trail goes on, past cliffs of roped up climbers honing their skills for greater heights, to Church Ope cove where locals enjoy a dip in the sea or try their luck spear fishing for sea bass. On flies the Peregrine, past long disused cranes used for loading the valuable stone onto waiting barges, until finally it reaches the Bill. Time for a visit to the lighthouse, a welcome bite to eat and a look round the visitor centre. Have you explored the wild side yet ? Hundreds of schoolchildren in extraordinary Jurassic-inspired costumes created a pulsating carnival of colour, dance, noise and excitement for Weymouth and Portland’s closing Olympic and Paralympic celebration - the Moving Tides procession. The children, from Weymouth, Portland and Dorchester were transformed into iridescent sea creatures as they danced their way along the esplanade, accompanied by junk bands and huge carnival dinosaurs. Moving Tides was originally scheduled for the day the Olympic torch arrived in Weymouth - but after extreme weather forced postponement, it was rescheduled - in an inspired move by organisers - to the final day of London 2012, September 9th. Animated films by children at two Weymouth primary schools have been selected for an international showcase of young filmmaking talent. The Big Splash and the Helpful Dead, made for the Olympics by pupils at St John’s Primary and Wyke Regis Junior schools will be part of Electric December, a countdown calendar featuring the best of young people’s short films from across Europe. The films, seen by thousands on big screens during the summer, will now bring Weymouth and Portland - as seen through the eyes of ten year olds - to an international audience. Over the course of a month in each school the young filmmakers worked with a group of six artists from Dorchester Arts, led by Sharon Hayden of digital arts organisation ScreenPLAY. She said the children gave both films a strong sense of place and local identity. 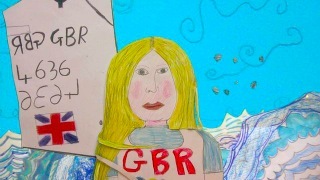 “In the Big Splash they wanted to capture the feel of the torch relay on Weymouth seafront and the determination and courage of a group of young people swimming across the bay. In researching Helpful Dead, the children found a head teacher’s diary from 1872 with descriptions of a shipwreck off the Chesil. This gave them the idea to link a Victorian tragedy with the 2012 Olympics,” she explained. The films, plus the third in the trilogy the Portland Race, were funded by the lottery through the BFI’s First Light initiative.